Welcome to private accommodation Ján Bednár. 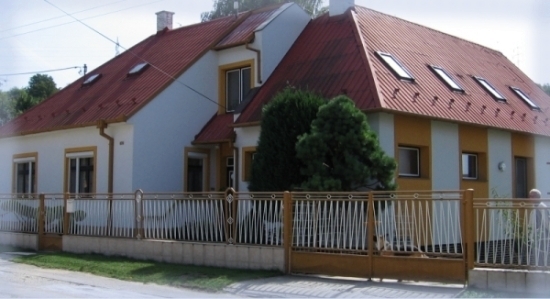 We provide comfortable accommodation, near the well-known spa town of Piešťany, in the village called Moravany nad Váhom. The accomodation is in a separate housing unit with its own entrance. It includes 2 tripple rooms and also an attic twin room, which can be used in the summer. Equipment: bathroom with a bathtube, fully-equipped kitchen with a refrigerator, ceramic hob, oven, microwave, satellite TV with DVD player, washing-machine, glass verandah, wine cellar, covered outdoor fireplace, covered outdoor swimming pool (solar-heated), gazebo, sauna, garden pond with a waterfall and fish. Parking space in the garden is included as well. The price is 10 € per person per night but the minimum price for the whole stay is 20 €. Children up to 3 can be accommodated free of charge.